Hendrik Antoon Lorentz was a Dutch physicist and a joint 1902 Nobel Prize winner together with Pieter Zeeman for his theory of electromagnetic radiation, which was validated by the findings of Zeeman. He was most famous for deriving the transformation equations which formed as the basis of Albert Einstein’s general and special theories of relativity. Hendrik Lorentz was born to Gerrit Frederik Lorentz, a wealthy nursery owner and Geertruida van Ginke on July 18, 1853 at Arnhem in the Netherlands. At only 4 years old, he lost his mother. Five years after his mother’s death, his father married Luberta Hupkes. 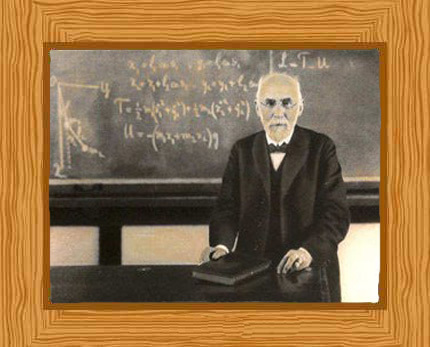 During Hendrik Lorentz’s time, his school held classes in the morning, afternoon, and evening. During evening classes, teaching was freer, more like the Dalton method. Hendrik attended Mr. Timmer’s Primary School until he was 13 years old. Hendrik was considered a gifted pupil. At the age of 9, he was already able to master the use of the table of logarithms. In 1866, when the first high school was opened at Arnhem, Hendrik was placed in the third form. He excelled in the science subjects and also in history and languages. After completing the fifth form he spent a year studying the classics. Lorentz then entered the University of Leyden in 1870 after passing the entrance examinations. There, he obtained his Bachelor of Science degree in Mathematics. The following year, he received his degree in Physics and began studying for his doctorate. In 1872 Lorentz decided to return to his home town of Arnhem where he taught evening classes, teaching high school physics and mathematics. At the same time, he continued working on his doctoral thesis, in which he refined James Clerk Maxwell’s electromagnetic theory. He presented his thesis, about the theory of the reflection and refraction of light, in 1875, and obtained his doctor’s degree at the age of 22. Two years later, in 1877, Lorentz was appointed to the chair of theoretical physics at Leyden University, a position newly created especially for him. He was only 24 years old at that time. For the next 20 years, Lorentz devoted his time in quiet and almost isolated study. He kept himself updated with the latest publications in physics without actually establishing personal contacts with other physicists abroad. His first international contact didn’t happen until 1897. By that time, he was already married and a father to three children; two daughters and a son. Though there were many invitations for him to accept positions overseas, Hendrik remained loyal to his Alma Mater. He held the chair at Leyden until his retirement in 1912. After retiring, Lorentz worked as Curator of Teyler’s Physical Cabinet at Haarlem. He was also the Secretary of the “Hollandsche Maatschappij der Wetenschappen” or the Dutch Society of Sciences. However, he retained an honorary position at Leyden University as Extraordinary Professor where he continued to deliver his famed Monday morning lectures until his death. Lorentz’s greatest science contribution for which he and his student, Pieter Zeeman received a Nobel Prize in 1902 was the development of the mathematical theory of the electron, which proposed that light waves were caused by the oscillations of an electric charge in the atom. His proposal came at a time when the existence of electrons was yet to be proven. Lorentz is also best known for his work on the FitzGerald-Lorentz contraction. In 1904, he introduced his transformations which basically described the increase of mass, the reduction of length, and the time dilation of a body that is moving at speeds closest to the velocity of light. This served as fundamental to Einstein’s special theory of atoms and theories of relativity. In 1953, Einstein wrote that Lorentz meant more to him than all the others he met on his life’s journey. In the autumn of 1911, Lorentz was the appointed chairman of the first Solvay Conference that was held in Brussels. One of the critical highlights of the conference was to take a look into the problems of having two approaches, classical physics and of quantum theory. Hendrik was said to have not been in total acceptance of the latter. Lorentz married Aletta Catharina Kaiser, the daughter of Johann Wilhelm Kaiser who was a director of the Amsterdam’s Engraving School and a professor teaching Fine Arts in 1881. His father-in-law also designed the first Dutch postage stamps. Interestingly, Aletta is also the niece of Frederik Kaiser, Hendrik’s astronomy professor who had strongly influenced him to become a physicist. Lorentz and Aletta had three children. The eldest, Geertruida Luberta Lorentz, went on to become a physicist, just like her father. The funeral was attended by several of Lorentz’s colleagues and distinguished physicists from around the world and even by the President, Sir Ernest Rutherford, who represented the Royal Society. In addition to being a Nobel Prize recipient, Hendrik Lorentz received other great honors for his outstanding work. He was an LMS Honorary member in 1898, and was elected as a Fellow of the Royal Society in 1905. He was the speaker at the International Congress in 1908, was awarded the Rumford Medal by the Royal Society in 1908 and the Copley Medal in 1918. Lorentz was also elected a Fellow of the Royal Society of Edinburgh in 1920. Hendrik Lorentz, although not totally recognized for his botany work was actually the author of some plant taxa. He co-wrote a couple of books with other botanists. The Lorentz crater in the moon was named after him.